Summary: These figures could have been a lot worse, given the estate-agency firm remains dependent mostly on the standstill London property market. The major highlight derived from the statement was that WINK continues to outperform Foxtons, and it appears the group is now using the difficult sector to expand its franchising network. Meanwhile, the financials remain in order, the outlook seems relatively promising and yet the valuation is still in the doldrums. I continue to hold. Click here for all my previous WINK posts. I wasn’t exactly sure what to expect with these interim results. True, WINK had signed off its 2016 annual statement by outlining its hopes for a “broadly flat” London property market for 2017. However, the first half of 2016 was supported by what WINK described as a “buy-to-let mini boom”. So this H1, when compared to last year at least, was never going to be great. Indeed, what with all the ongoing economic and political matters, plus affordability and stamp duty concerns — and then facing some underwhelming figures from larger rival Foxtons (FOXT) — it was easy to expect bad news. In the circumstances, I felt WINK’s first-half achievements were quite respectable. 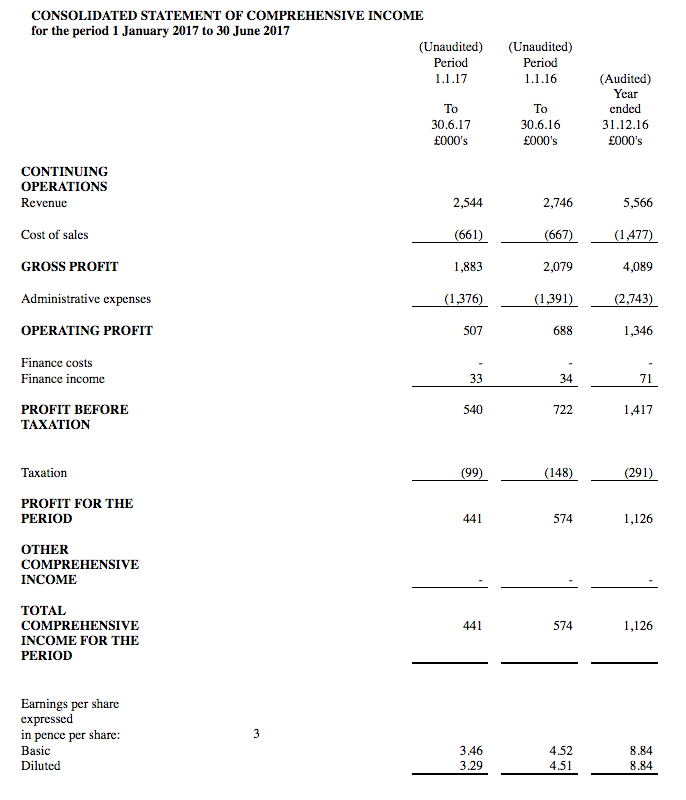 Revenue declined 7% to £2,544k while operating profit dropped 26% to £507k. I couldn’t really complain about WINK’s revenue progress. Commissions from property sales fell 18% in line with transaction numbers, while lettings-related income advanced 4%. I note the more predictable lettings-related income represented 45% of total revenue during the half. However, the real highlight for me is that WINK continues to outperform FOXT. While this comparison may not be strictly like-for-like — WINK generates about 80% of its revenue from its London-based franchisees, while FOXT’s income is almost entirely derived within the capital — I think the overall trend is quite accurate. With WINK’s franchise network increasing its revenue from 37.3% to 39.4% of Foxton’s top-line, it seems to me WINK’s self-employed franchisees are coping with London’s awkward property market somewhat better than FOXT’s corporate employees. WINK’s finances look in good shape. The group continues to take a meaningful 12% cut of its franchisees’ income, the 20% operating margin remains very respectable while capital expenditure — at just £57k for this H1 — is still remarkably low. It all meant cash finished the period at £3.0m and the balance sheet remained free of debt. Let’s not forget that, at the end of 2016, WINK had also loaned its franchisees a total of £1.2m and I’m guessing that figure is about the same now. Plus, this half enjoyed interest income of £33k, which I reckon related almost entirely to the outstanding franchisee loans and represented a useful 7% of operating profit. I attended WINK’s AGM last year and the chairman suggested then that a greater number of offices did not necessarily mean a greater profit for shareholders when a buoyant market started to fall. WINK has opened seven new offices this year and has “a number of new offices lined up for launch for January 2018”. The details about new offices suggest the traditional high-street agent is not dead just yet… despite everything you hear from online competitor Purplebricks (PURP). Since my write-up of WINK’s 2016 results, I have increasingly questioned PURP’s business plan and operational quality. You can read my Comments here, here and here. While I am not writing off online agents entirely, I now feel there will be ample opportunities for good, traditional agents to prosper. I think it is fair to assume the upcoming second half should be at least as good as the second half of 2016. If that is the case, then full-year revenue could be £5.4m and operating profit could be £1.2m. 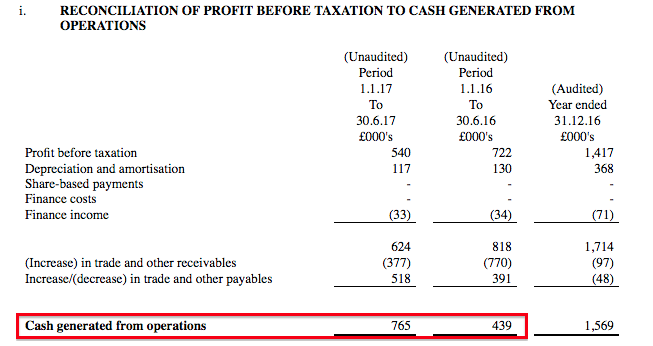 Operating profit may even be £1.3m if there is not a repeat of a £106k write-off (point 6). Applying tax at 19% gives earnings of 7.4p per share, or 8.1p per share, depending on your view of the £106k write-off. Adjusting the £12.7m (at 100p) market cap for my £4.2m guess of cash and franchisee loans, I arrive at an enterprise value of £8.5m or 67p per share. Then dividing that 67p per share by my earnings estimates gives a P/E of around 9. That rating does appear good value to me, especially given the current stock market where any half-decent business seemingly enjoys a multiple in the high teens or beyond. In fact, I am struggling to think of another quoted company that is valued on a single-digit multiple and yet offers net cash, high margins, generous cash flow and the prospect (perhaps!) of steady growth during the next few years. In the meantime, the trailing 7.2p per share dividend continues to be distributed through quarterly 1.8p per share payments and supplies a 7.2% income. This entry was posted in M Winkworth, My Shares and tagged M Winkworth, WINK on September 13, 2017 by Maynard Paton. Nothing unusual here, with the same 1.8p per share payout as the previous 6 quarters. I guess the full-year payout is heading for 7.2p per share, to match last year’s level. As I have pondered before, whether earnings are heading for the same level as 2016 is another question of course. Estate agency franchise business Winkworth is set to open three new offices early this year, taking the total to 102. Seven new office openings in 2017 took the brand to a total of 99. More openings are set to follow. The openings in 2017 included three new franchises in Cheltenham, Gloucestershire; Sunningdale, Berkshire; and Surbiton, Greater London. There were three conversions in Dartmouth and Torbay, both in Devon, and in Kingsbury, London. An existing franchisee opened an office in Milford-on-Sea in Hampshire. It also received more enquiries from potential new franchisees last year, up 26% on the year before. CEO Dominic Agace described 2017 as “a brilliant year for the growth of our network” and said this year would also be one for expansion. The growth heralds positive news for the franchising business, after it reported a slide in revenues and a drop in pre-tax profits in September last year, amid an 18% fall in the number of properties sold. In the six months to the end of June its interim revenues were down 7.6% to £2.54m, while pre-tax profits plunged 25.2% to £0.54m, down from £0.72m for the same period the year before. Sadly the “brilliant year for the growth of our network” did not translate into brilliant half-year figures during 2017. I am hopeful WINK’s full-year results, due in March, can reveal improved progress. I am sure this is WINK’s first-ever post-year trading statement. It is nice to see WINK (and TAST last week) begin to issue such timely updates. In the past, WINK shareholders had to wait for the annual results in March, April or even May to learn what had happened the year before. M Winkworth plc (“Winkworth” or the “Company”), the leading franchisor of real estate agencies, is pleased to announce the following trading update for the financial year ending 31 December 2017. As has been widely reported, the UK residential sales market experienced a reduced number of transactions in 2017. Against this challenging background, Winkworth is pleased to announce that, following further growth in its lettings business, the Company’s total revenues for 2017 will be broadly in-line with market expectations. The revenue figure is expected to be less than 5% lower than 2016, a year which saw transactions in the first quarter boosted by buy-to-let investors completing purchases before the introduction of a higher rate of stamp duty. It is pleasing to report that the Company’s revenues in the second, third and fourth quarters of 2017 all grew year-on-year and, subject to audit, profits before tax are expected to be slightly ahead of market expectations of £1.3m. Over the course of the year the Company opened seven new offices, raising the total number of franchised outlets at year end to 99 (versus 94 in 2016). An additional three offices will open in the first quarter of 2018 and we expect further opportunities both to convert existing businesses to the Winkworth brand and to grow new franchises. The Company expects to announce its final results for the year ended 31 December 2017 on or around 28 March 2018. Winkworth ended the year with an improved net cash position and the directors are pleased to announce that the Company will pay a dividend of 1.85p per share for the fourth quarter of 2017, bringing total dividend payments for the year to 7.25p (2016: 7.2p). Revenue for 2016 was £5,566k, so revenue for 2017 — at less than 5% lower — should be at least £5,288k. The expected pre-tax profit of £1.3m compares to £1,417k for 2016. My early sums indicate H2 pre-tax profit was £760k, up 9% on the £695k registered for H2 2016. It was encouraging to read WINK’s revenue gained during Q2, Q3 and Q4 when compared to the relevant quarters of 2016. Also, the Q4 dividend lift — from 1.8p to 1.85p — is promising. I had expected another 1.8p per share payment.